OK, so the blogger orders delivery pizza from Papa John's every so often... Well, often enough to save the pizza in the 'favorites' list... then on each login to order using the favorites functionality. 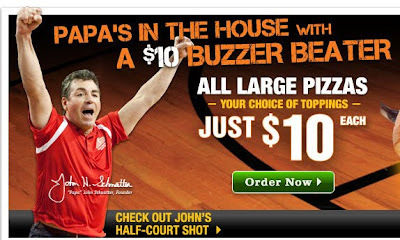 One day doing so this blogger happened to notice the 'all large pizzas $10" on the front page. Went to place the order using favorites as usual and... hey, wait a minute... why is it still $17.60?? OK, forget the favorites, build it from scratch and it is just $12 (the $10 plus the $2 delivery fee). OK, so why doesn't the system 'adjust' the price down when the pizza is on 'special'? Inquiring minds would like to know. Also, how often has this blogger "overpaid" for his pizza when it has been on 'special? Convenience is one thing, but silliness like this makes it feel like a rip-off.